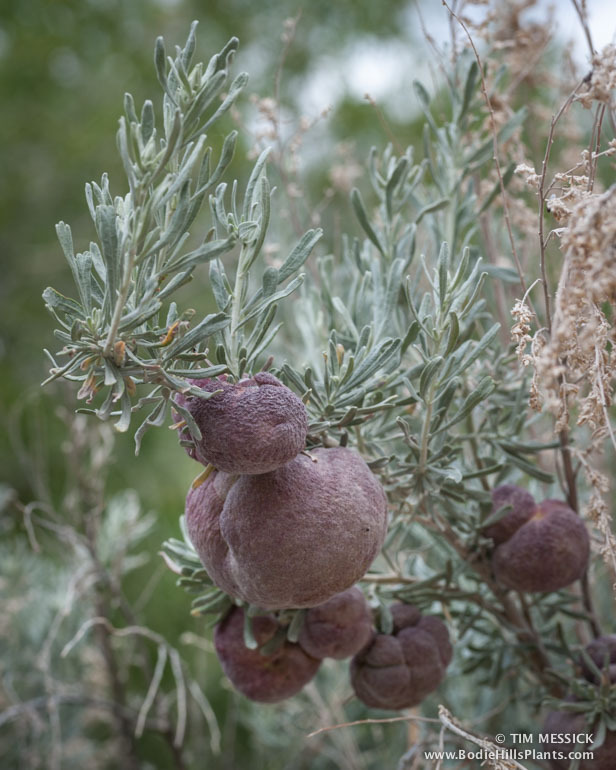 Early last spring, driving along the road past “The Elbow”—that sharp bend in the East Walker River that touches the northeast edge of the Bodie Hills—I was struck by the abundance of large galls on the branches of big sagebrush (Atremisia tridentata subsp. tridentata) beside the road. They were the size of walnuts to small apples. 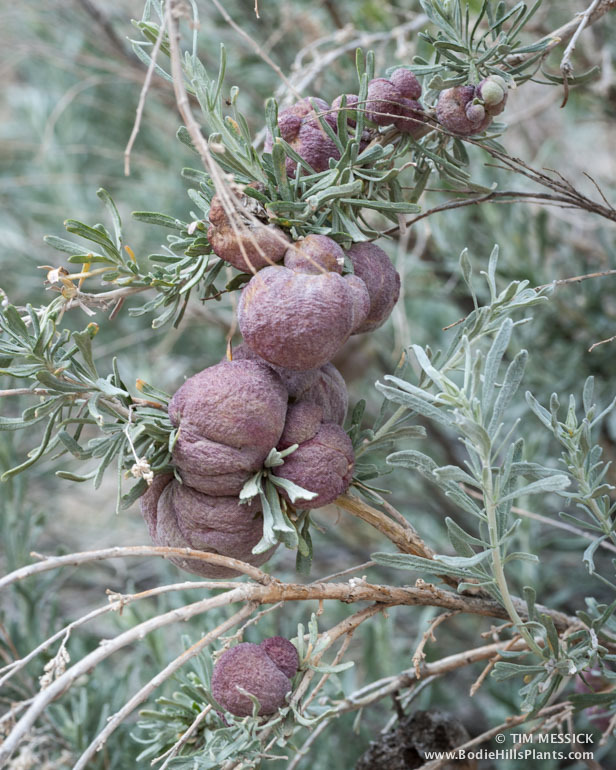 A bit of searching about galls on sagebrush led me to a post by Jonathan Neal on the Living with Insects Blog, which identified these as galls of the sponge gall midge (Rhopalomyia pomum, in the gall midge family, Cecidomyiidae). These tiny, delicate flies lay their eggs on the stems of big sagebrush. 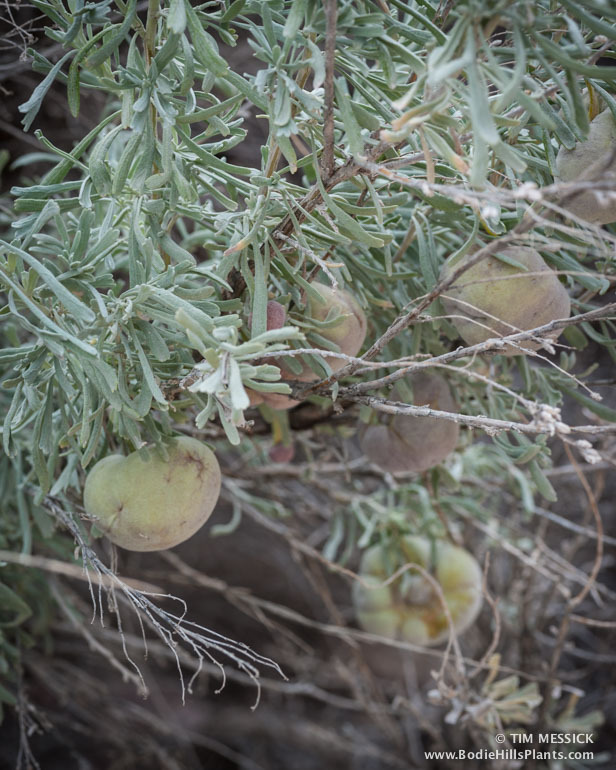 When the larvae hatch, they chew on the plant and chemicals in their saliva induce the growth of these large, soft-spongy galls on the stems. The larvae continue to grow and feed on the interior of the gall. With some luck, adult midges will emerge and renew the life cycle. Unlucky midge larvae may become hosts for tiny wasps. Wasps in Eulophidae and Platygastridae (and probably other families) are parisitoids (parasites that ultimately kill their hosts) that will lay their eggs in the developing midge larvae within the galls. The wasp larvae consume the midge larvae, and adult wasps, rather than adult midges emerge from the gall. Welch (2005) surveyed the literature and found mention of at least 42 midge and aphid species known to produce galls on big sagebrush. Many other insects and arthropods are associated with sagebrush in various ways. Not to mention the birds, mammals, fungi, and even lichens that will live in an area only because sagebrush is a dominant species. This all illustrates how sagebrush can be a “foundation species“—one that has a strong role in structuring a community and makes it possible for many other species to exist wherever it grows in abundance. Reference: Welch, Bruce L. 2005. Big sagebrush: A sea fragmented into lakes, ponds, and puddles. Gen. Tech Rep. RMRS-GTR-144. Fort Collins, CO: U.S. Department of Agriculture, Forest Service, Rocky Mountain Research Station. 210 p.
A year ago I decided to update the “Flora of the Bodie Hills” I had written 3.3 decades ago as my MA thesis at Humboldt State University. Why? There have been many nomenclatural and taxonomic changes in the flora, many more species have been found by subsequent collectors in the area, and there is now greatly simplified access to all this information through the internet. The Bodie Hills are rich in plants, wildlife, human history, geological interest, and recreational opportunities. More than ever, the natural resources of the Bodie Hills should be explored, documented, managed, and protected for all who enjoy the area. Plants of the Bodie Hills, an Annotated Checklist is a free, 47-page PDF document (5.1 MB), available for DOWNLOAD HERE. This first edition is dated January 3, 2016. Future editions will be released occasionally, as additions and corrections are made. This annotated checklist is an alphabetized list of plants by family and scientific name, with notes on distribution, habitat, and information gleaned from herbarium specimens. There are currently no keys, photographs, or illustrations, but I hope to add these in the future. Meanwhile, selected keys, photos, and other natural history notes will be posted occasionally here at BodieHillsPlants.com. Let me know what you think! And please tell me if you find additional plants in the Bodie Hills or errors that need correcting. Leave a comment below, go to the Contact Page, or email me at tmessick1[at]gmail.com. Thanks! There are 2 species of violet in the Bodie Hills, easily distinguished by flower color and habitat. The scientific name of the commonest violet, however, is misleading: Viola purpurea (Golden violet) isn’t obviously purple. It has bright yellow flowers, but the backs of the upper petals have some purplish-reddish-brown (see photo below). Golden violet grows in relatively dry woodland and sagebrush sites. Viola nephrophylla (LeConte violet) has blue to violet flower petals (not quite purple either). LeConte violet grows in wet meadows. Several subspecies of V. purpura occur in the western Great Basin and eastern Sierra Nevada; but these are variable and they intergrade, so some plants may not fit neatly into any one of them. Plants growing in shade often produce larger leaves and longer stems than those in full sun. Subsp. aurea may be the most prevalent in the Bodie Hills, but subsp. mojavensis or others may be present also. Keys adapted from: R. John Little 2014. Key to Viola, in Jepson Flora Project (eds.) Jepson eFlora, http://ucjeps.berkeley.edu/cgi-bin/get_IJM.pl?key=10278, accessed on December 22, 2015. What does “canescent” mean? Check out the Jepson eFlora’s Glossary.